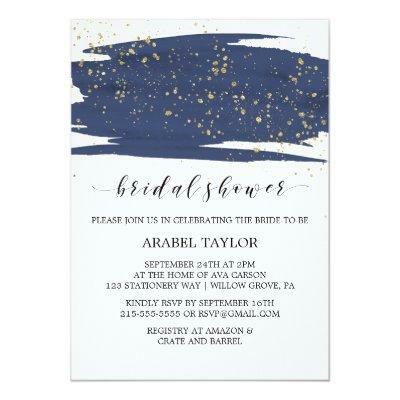 This watercolor navy and gold sparkle bridal shower invitation card is perfect for an elegant wedding shower. This abstract starry night design features a dramatic brush of navy blue watercolor overlaid with beautiful faux gold glitter. Please Note: This design does not feature real gold glitter. It is a high quality graphic made to look like gold sparkle.